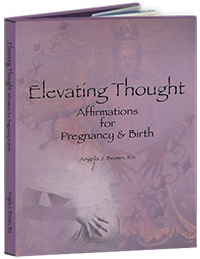 My client gave me permission to share her incredible journey of healing and transformation during her pregnancy. I thought her experience could help other pregnant women having this same experience. “I experienced a miracle this pregnancy and I want to share it. Shortly after I found out I was pregnant I started having pretty bad morning sickness that got progressively worse and worse. Nothing seemed to help and eventually I couldn’t even hold down water and had to go to the emergency room. For the next few weeks after that I visited the emergency room or urgent care multiple times. I was told in these visits that I had a condition called Hyperemesis Gravidarum. A condition which less than 3% of pregnant women experience and is essentially extremely severe morning sickness. At the urgent care or ER I would be given fluids and offered a few medications but mainly I was told there is almost nothing that could be done for me. The medical community does not know what causes this condition or how to fix it. I was told some people experience it just in the first trimester and others will have it there entire pregnancy. Then I’d be offered a few medications for nausea. A lot of nausea medications are not considered safe for pregnancy but there are still some that are considered reasonably safe. The most effective one recommended was also the most dangerous. The doctors and nurses seem to vary and how much they worried about me taking it. I was so uncomfortable and so sick and so desperate that I took it anyway. One doctor took me aside and told me she was extremely concerned with offering this medication because of the possible side effects but left in my hands. Another one printed out a study and other information with warnings about it. Others said it would probably be fine. I generally go holistic with my health care so the fact that I took that medicine repeatedly tells you how desperate I was to get some kind of relief. I was losing so much weight and unable to even drink water a lot of the time. The sad part is is that it didn’t even work. My body didn’t respond to any of the nausea medications that were offered. Eventually I had to be admitted to the hospital. I was told my blood work resembled a person who was starving to death. My body was starting to eat itself under the pressure of growing a fetus and keeping me alive on no food. I was hooked up to a bunch of IVs and given a lot of vitamins to reverse the starvation process and build up my body. By this time my forearms were black and blue because of the number of IV’s I was being administered and the fact that I usually had to be poked a couple of times because my veins kept collapsing due to dehydration. That night in the hospital was a real low point for me. I couldn’t get comfortable because I was so nauseous and the IV fluid burned going into my arm. I had sent Brett home so he could get some rest because one of us had to hold down a job to cover the mounting medical bills I was accumulating. I knew I would be up most of the night and there was nothing he could do. As I lay there I thought about articles and a medical study I had read when I was first diagnosed with hyperemesis. One of them talked about this experimental drug that a few women were willing to try that some people felt hopeful about. The study discussed how most of these women were on the brink of getting an abortion because of how bad their hyperemesis was. They were willing to try this experimental drug as a last ditch effort to save the pregnancy. I thought to myself when I first read the article: “Wow, it can get that bad?” Laying there that night I felt like I completely understood those women. I was beginning to buckle under the weight of my sickness. I was weak, and tired and scared and so so so unbearably nauseous and I didn’t know how long I could go on like that. It felt like the pregnancy was on a track to kill the baby and I. And likely without IV fluid it could have. I went from living a normal healthy life to being almost completely unable to function within a few weeks. When I was released from the hospital I had to move in with my parents so I would have someone to help take care of me during the day while Brett was at work. It was a relief to not be alone with my nausea all day. My mom was really good about coming and putting her hand on my back while I vomited. Something Brett and I discovered helped me feel better and less alone and scared in those moments when I felt like I was completely losing control. One of those glamorous evenings when I thought things could not get any worse all of the sudden my back seized on my right side by my spine. I could barely take in air! It hurt so much. I could not even lay flat! Brett and I were at a complete loss. He got some ice and my mom grabbed some ibprofen and I had to sleep sitting up in an arm chair. The next day I desperately combed the Internet looking for a chiropractic office that was open. The one I usually went to was closed on Saturdays. I was hoping maybe a back adjustment would help the pain and maybe some type of massage. I was sure all the violent vomiting somehow threw out my back. I looked for non-impact chiropractic in my area and called maybe 10 or 15 offices. Finally I came to this one called the Cohn Health Institute. I didn’t really know anything about them except that they did non-impact chiropractic there. The receptionist told me that they amazingly had a cancellation that morning and could see me in an hour. I was able to see a practitioner named Doctor McCoy. A chiropractor but also an expert in so much more beyond standard chiropractic I would come to learn. I came in and sat on the table and she asked me what was wrong and I just started bawling. Like ugly crying in front of this stranger. I told her what I had been through in the last couple months with my hyperemesis and now with my back. I explained to her that I just wanted to be able to lay flat on my back again so I could sleep at night so if she could help me with that I would be very grateful. Surprisingly she said she thought she could help me with both my nausea and my back. I was a little doubtful. Some of the best OBGYN’s at Cedar Sinai medical center told me there was nothing that could be done for me. And I had already been to a few other holistic practitioners who were unable to help. However, I tried to keep an open mind. To make a long story short, she worked on my back and neck and skull, did some protocols to strengthen my organs and improve the connection between by brain and my nervous system and by the end of the visit I was lying flat on my back and for the first time in months was feeling HUNGER. REAL HUNGER. I could not believe it. It was like walking out of a deep abyss. More ugly crying. Except this time it was gratitude. I was told I was beyond help and then all of the sudden there was this hope that my pregnancy might be manageable! I went home and ate a real meal. Something I will never take for granted again by the way. It wasn’t an immediate fix (My whole body was so wrecked from starving and growing a baby and not being able to sleep) but within two weeks of starting to see her I was able to eat like a normal person and all of my back pain was gone. If I had a nausea spell (and I mean nausea no more vomiting!) later on I could go to her and her colleague Doctor Christine and they were able to identify the trigger! Usually some food I needed to avoid for a while, like bananas for example. And I would do it and the nausea would be gone. Its hard to explain the night and day difference I felt after receiving treatment but I hope you get the point. I have continued to see her throughout the pregnancy, luckily for more normal pregnancy things like my hips or back aching and the results in the form of relief have been incredible. During our last ultra sound Brett and I were thrilled to find the baby totally healthy, head down, and in the perfect position to birth. And a pound heavier than the norm! The ultrasound tech said what cute chubby cheeks he had.